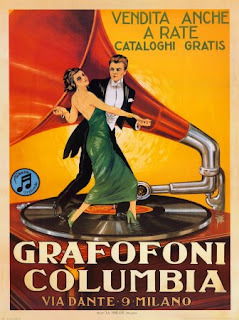 Grafofoni Columbia, 1920 Poster. Grafofoni is Italian plural for graphophones. The graphophone was an improved version of Thomas Edison's phonograph invented by the laboratories of Alexander Graham Bell. The trade name graphophone was used by the successor of the American Graphophone Company, Columbia Records as the name for their version of the phonograph. The name graphophone was used by Columbia into the 1920s or 1930s.